The California Code of Regulations (CCR) Title 8, Section 6151 dictates when fire extinguishers need to be serviced. 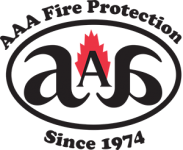 Businesses throughout the Tracy area, the entire East Bay Area and into the San Joaquin Valley rely on AAA Fire Protection Services to service and maintain their fire extinguishers. With over 40 years of experience, we offer a full-service suite of fire suppression and fire protection services to businesses just like yours. Our services are comprehensive and affordable, and we make it easy for businesses to comply with the California code of regulations. Our fire extinguisher services are scheduled annually and include documentation that shows that your business is in compliance. We also offer complete fire extinguisher sales so that your business has the proper size fire extinguisher and the proper type of fire extinguisher in locations where fire extinguishers are required. For more information about our fire extinguisher services or to schedule fire extinguisher services, just give us a call at (800) 543-5556. Our professional team can make an appointment for you or will happily answer all of your questions.